Ever since the the establishment of Turlock High, traditions have been centric to the student experience. One of the most important traditions is the one that has been around the longest: the Alma Mater. Chanted at the end of every victory, the Alma Mater brings everyone together, from freshmen to seniors, in one of the most iconic moments at a football game. The tradition continued this year. Football players ran towards the crowd to stand with the cheerleaders, and everyone joined together and sang the Alma Mater at the top of their lungs. Afterwards, students celebrated the Harvest Bowl win at In-N-Out, another post-game tradition. Sitting in the back of their trucks and cars, students join together to eat with both Pitman students and students from surrounding schools. At the end of Harvest Bowl, the winning team (ie. 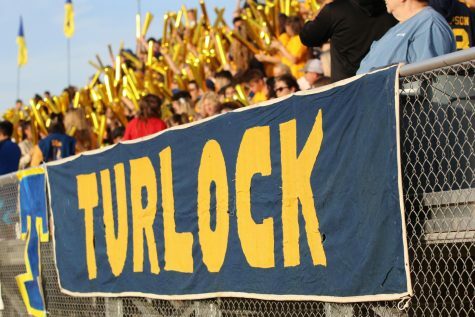 Turlock) usually takes a photograph with the trophy and the triumphant scoreboard. This year, however, there was an absence of this iconic tradition, upsetting many that know this tradition needs to be kept alive. The traditions at Turlock High have been apparent at every football game of the season. At the 15th annual Harvest Bowl especially, these traditions have helped to unify the students into one large, chanting, blue and gold crowd.